Women’s charm pendants have been captivating us humans for generations. The ancient Egyptians believed these would keep away evil forces and provide protection to them. Charms have been used as amulets to protect and defend their owners for centuries in many different cultures. These have evolved over time, but are still one of the most popularly worn pieces of jewelry. These days, charm pendants are worn for many different reasons. A common and affordable setting for diamond charms is sterling silver, which is not only an elegant setting, but the tone of the metal provides a true versatility to any piece, allowing it to be worn at all sorts of occasions. Women’s sterling silver charm pendants are certainly a simple yet beautiful addition to any outfit and can light up a simple look. 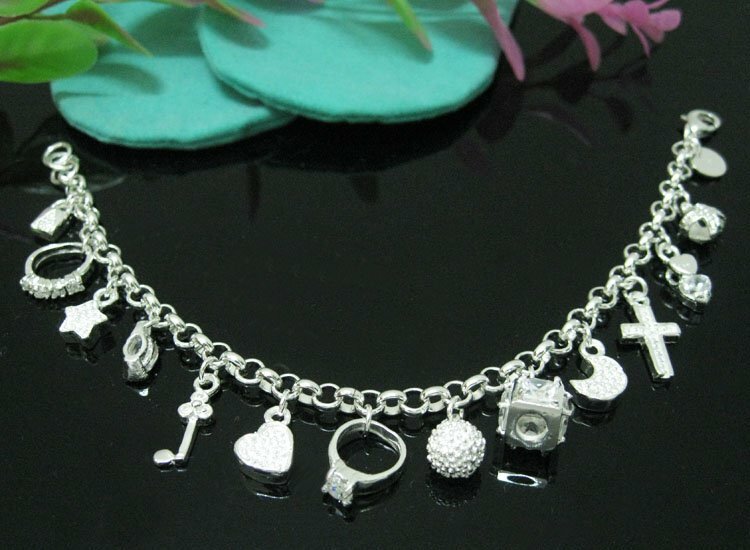 These charms come in many different designs, so feel free to express yourself with a charm that showcases who YOU are. Whether you want to portray your spiritual side with a cross charm or your fun loving nature with something upbeat like a dolphin, the options are endless. Sterling silver charms also come in a range of colors; if you’re a fan of shades that pop, play up your look with vibrant charm pendants with gemstone settings such as rubies, emeralds and sapphires. If you like to go big with your accessories, charms are just the thing to help you achieve that bold and edgy look that other pieces of jewelry can’t. With designs ranging from simple keys and hearts to the option to fully customize, you can get yourself any design you can think of! TraxNYC’s large and elegant collection of sterling silver charm pendants is sure to be an amazing addition to your wardrobe. Choose from designs such as symbols of love-hearts, to charming elephant charms that will add a hint of fun to your ensemble. Based in New York City at the heart of the diamond district, TraxNYC receives shoppers from all over the globe. To meet the demands of our clients we also feature the option of online shopping on our website. We pride ourselves on presenting to you the finest diamond jewelry in the market.